At the heart of my work is the idea of liberating the best effort that each individual has to offer in service to your organisation and more broadly. This liberation requires the capacity of people managers to create a human environment in which every person is fully engaged in what they are doing. Creating that human environment requires and generates trust. Much has been written about trust within a leadership and organisational context, just Google it, and you will find thousands of articles! But my reflections recently have brought me to a somewhat radical, root of the root, type of idea. Hierarchy, the traditional structure of organisations, destroys trust! Because in a traditional hierarchy, employees don’t get to negotiate their self-interest and are asked to put their self-interest aside for that of the organisation’s. Traditional organisations have developed from ideas that include the old military, command and control model combined with the very subtle assumption that any organisation can and should be a well-oiled machine. The command and control model means that those in senior positions of authority make decisions and tell others what to do based upon their superior perspective and knowledge. In days gone by when the world was seemingly less inter-connected and when changes occurred at a less furious pace, keeping existing knowledge intact, the command and control model may have made sense. But neither of these preconditions remain the case today. There is no doubt about our global inter-connectedness, and new knowledge is revealed at a mind-boggling pace. Answers that worked yesterday can not be relied upon to work today or tomorrow. One person can not possibility have enough knowledge and a broad enough perspective to develop the answers to complex challenges. A major unintended outcome is likely to occur if the senior manager persists with a command and control style in today’s circumstances. They will not come up with very compelling answers – because it defies logic that they could. And as the manager makes poor decisions, trust erodes in him or her. Trust develops through meeting expectations and through being competent. Making poor decisions does not reinforce a sense of trust in the manager’s competence. There is one more important facet of Command and Control I want to emphasise. It implies that management does not trust other employees to have good ideas or the organisation’s interests at heart. 2. Hierarchy – whose interests are being served? Let’s cut right to the chase. When an organisation is set up on hierarchical lines (and a hierarchy is just one way of organising although it may seem like the only way), then people wonder whose interests are being served. If team members do not have a chance to negotiate their self-interest, then they are unconsciously being asked to surrender that self-interest. Most hierarchical organisations have done that for the last 50 years, as the focus of attention has been shareholder value and profit in most businesses and what the elected member wants in government organisations. When power and privilege (i.e. a senior position in the hierarchy) mean senior management or even ownership interests are served before those of others, it follows that those without power and privilege will feel a sense of distrust of those who possess that influence. An alternative way of thinking about the structure of an organisation comes to us from the science of living systems. A living system is sustainable (meaning thriving into the future) when it negotiates its self-interest with that of the larger systems in which it exists, and when the subsystems that comprise the system of interest negotiate their self-interest with the system. It is a state of “intelligent dynamic harmony” that optimises the whole. 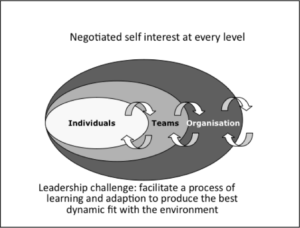 More simply and plainly, when a team member can negotiate their self-interest with those of the organisation, the organisation is optimised, and the individual feels similarly served. Trust has a chance to develop and be maintained because everyone is winning. The role of senior management shifts from having answers, to facilitating a process of continuous learning and adaptation to produce the best fit with the organisation’s environment. engagement because each team member’s contribution is valued. Interested to know how to evolve an organisation that trusts and benefits? Contact me and I will shout the coffee!